Freelance Writer living in South east London! Like my writing style? Subscribe!! Croydon. Some may think it has a bad name with all the riots that went on down here, but in actual fact Croydon is the place to be! Bustling with people 24/7, Croydon has a fairly big array of different things do, there is Grants Cinema, Clubs, Restaurants, Parks, Churches, Schools, and not to mention a large shopping centre, unlike Bromley where most of the shops are quite a distance away from each other, Croydon's shops are thankfully close together. 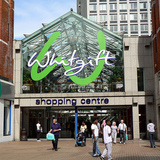 The shopping centre consists of a High Street, the Whitgift Centre and Centrale Shopping Centre. The High Streets consist of shops such as Marks and Spencer, Primark, Virgin, T-mobile, WHsmith, JD sports, Allders, Maplin and food stores such as Starbucks, McDonald's, KFC , Pizza Hut, Nando's and Subway. The Whitgift Centre is a big glass building which also consists of more shops such as Sainsburys, Footlocker, Body Shop, Swarvoski, G-star, Clintons, Card factory, River Island, H&M, Superdry, Sports direct, PCworld and Curries, Urban Junction, Poundland, Mothercare plus much more. Not forgetting food & drink shops, such as Millies Cookies & Shake Away. Cantral, which is opposite the Whitgift Centre, consists of even more shops, plus a big food court at the top where you can sit and eat. The shops - TK Maxx, McDonald's, Fusion, Bank, Uniqlo, French connection, Pineapple, Debenhams, plus much more. Apart from the shopping aspect of Croydon, it also has superb nightlife, with bars and clubs such as Tiger, Tiger and Roxy Bar where you can enjoy a lively night out. Or if you just want to enjoy a relaxing evening there is Nando's and Pizza Express (near South Croydon). Getting to Croydon and getting around Croydon proves to be relatively easy because there are many forms of Transport that go and that can lead to literally anywhere in London. There are Endless Buses in Croydon such as the 466,312,197,109,250,407,198,119,410,75,157 and night buses also travel through. Major train stations such as East Croydon/West Croydon are easily accessible. The Tram which runs through the centre of Croydon - it goes all they way up through New Addington to Elmers and and Wimbledon. Black Taxis are always available from around the centre. So overall, Croydon is a great place to be. There are also lots of job opportunities to be taken too. Why? Croydon is the place to be!